Severely injured troops recovering at the Tampa Polytrauma Rehabilitation Center crowded eagerly in the lobby of Texas De Brazil Steakhouse for the annual Freedom Alliance Troop Appreciation Dinner. John, from St. Petersburg, was included in those waiting to be seated. Husband and father of five, John lost his legs in an explosion in Afghanistan and now uses a wheelchair. Having attended last year’s dinner, he was one of the first to arrive and the last to leave. “I look forward to this event every year,” he told us. The venue was new this year, as were several additional attractions, including crayons and activity place mats for the children. A photo booth with a professional photographer was provided. We printed each guest’s photograph and mounted it in a keepsake Freedom Alliance frame to remember their night out away from the hospital. Apart from the first-class setting and other special touches was the outstanding fare. Filets wrapped in bacon, Brazilian sausage, lamb chops and other delicate cuts circulated the room with servers. Dinner guests also savored a superior salad bar with fresh mozzarella, soups, parmesan, hearts of palm, and asparagus. Private First Class Joseph from Atlanta was another repeat participant. Joseph suffered a cardiac arrest during boot camp, fell into a coma, and woke up just in time to attend Freedom Alliance’s dinner last year. He came again with his parents, Tony and Mary, and chatted excitedly about his plans to celebrate his twenty-first birthday in Las Vegas with his dad. Sergeant Austin, who was injured during his 2009 deployment to Afghanistan, came also with his wife, Donna. Paralyzed from the waist down, Austin brought another special guest—his service dog, Guss. “I tell you,” he said, “I’ve been looking forward to this event, and there’s been a big buzz at the hospital today.” Despite his handicap, Austin enjoys sports, such as hunting, wheelchair basketball and softball. Romey is another veteran who attends the dinner each year with his buddy Joel. Romey lives with a spinal cord injury and gets around in a motorized wheelchair. A longtime Freedom Alliance friend, his daughter attended our Military Leadership Academy (MLA) in the past and is now enrolled in college. She was unable to be at the dinner, but the rest of Romey’s family was there with him. We met many new friends as well. One was Mike, who is being treated for a traumatic brain injury; he arrived at the Tampa VA only a few months ago, and his parents, John and Brenda, came just in time for the dinner. “It’s so nice to get out of the hospital and just feel normal again,” Mike told us. His parents were so proud of their son, who was injured during his recent tour in Afghanistan and has relearned how to walk in a short amount of time. 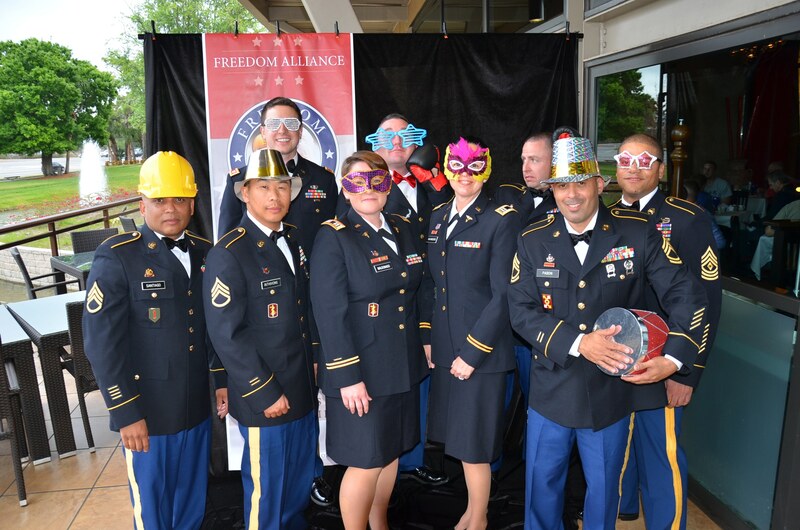 This dinner was a spirited success, showing the troops that Freedom Alliance and our supporters appreciate their service and sacrifice. We look forward to seeing our old and new friends again next year at the Troop Appreciation Dinner for Tampa Polytrauma!